Didier Drogba was punished for arriving late to camp ahead of Ivory Coast's African Cup of Nations qualifier against Burundi on Sunday. The Ivory Coast Football Federation's (Fif) president Sidy Diallo confirmed his faith in the Elephants' coach Francois Zahoui days before the team played its final Afcon qualifier; "You are the only chief on board, work and show that you are in command of your troop," he said. 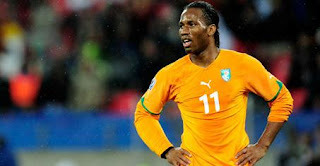 Zahoui did not hesitate to put those words into action when his captain Drogba reported late to camp ahead the much-awaited match, which marked the return of the Ivorians to their home ground, the Stade Felix Houphouet Boigny. The Chelsea attacker was handed an immediate sanction by the coach, who said he would be doing without the services of the team’s all-time top scorer.